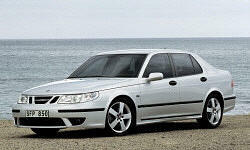 Why the 2004 Saab 9-5? Very logical and minimalist approach, you only get what you need, no toys no trendy gizmos (iDrives, Navs, multi-color displays and touchscreens, etc.). Explosive turbo performance, The car begs and provokes to drive energetically. Yet remains very stable and safe. ECM is made to digest any gas between Regular and Premium. Multi-adjustable orthopaedic dream. 3 memory settings. 3 adults can sustain rather long trips, even one in the middle gets decent seating position not requiring human origami. Why Not the 2004 Saab 9-5? While basic Arc suspension setup is excellent, Aero was made overly harsh and bumpy, to the point where it affect it stablility on grooved tracks. Soft tires are a must. Depends on your point of view. If you like to count cup-holders and poke around touchscreens and multi-level menus - this is NOT the right car for you. Dismal record up to 2000, at best unstable results to 2003, fixed all problems only by Model Year 2004. Very few around, parts prices are insane, be prepared to drive across half the country (in Canada) to find a truly qualified mechanic. One has to be VERY careful when shopping, the car requires constant learning and very educated approach, not suitable for an average A-to-B person. Owning earlier model years (pre-2004) can make you allergic to any SAABs, not just 9-5s.